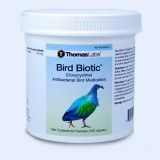 Bird Biotic is manufactured by Thomas Laboratories and is a Pharmaceutical Grade Bird Antibiotic. 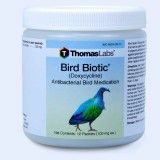 It is made of Doxycycline 100 mg. 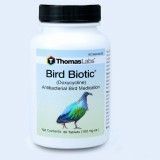 Right now it is available in 30 and 100 count bottles, and in capsules and tablets. 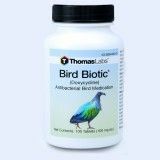 Thomas Labs makes the highest quality fish and bird antibiotics available. 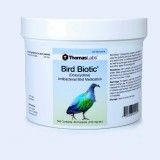 Every bottle of Bird Biotic is safety sealed and has directions and dosage for birds and also clearly marks the medicine expiration date.